Hot Tub Maintenance Guide To Help You Protect One Of Your Greatest Assets! You may already know what kind of hot tub you’re buying or where you want to install it. But hot tub maintenance usually doesn’t land on the radar until something goes wrong. It’s important that you consider hot tub maintenance costs, schedules, and procedures before making your purchase. But even if it’s too late for that, our hot tub maintenance guide will show you everything you need to know (or wish you had known earlier) about keeping your hot tub shining like new. 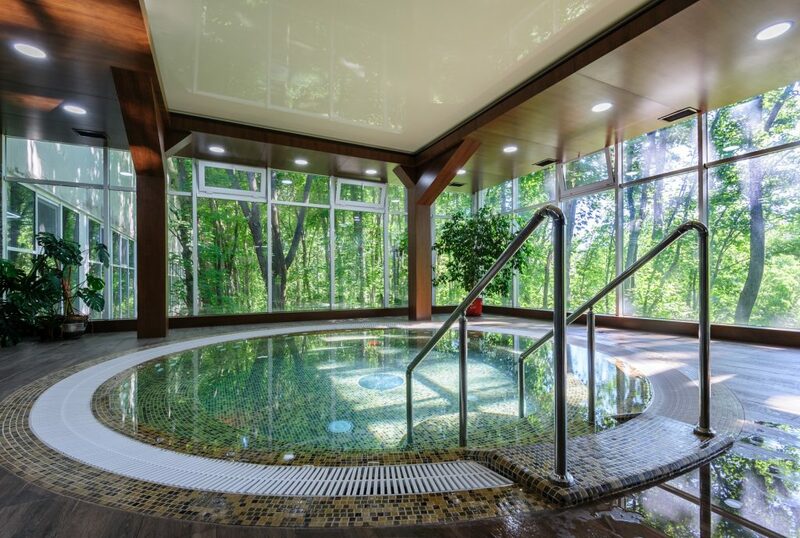 Just like cars, pianos, and your own body, hot tubs need a tune-up every now and then. Regular hot tub maintenance and cleaning can go a long way in ensuring you get the most out of every minute you spend there. You wouldn’t skip cleaning the tub inside your home, right? Just like regular bathtubs, hot tubs can play host to germs, bacteria, mold, and other debris if you don’t prioritize regular cleanings. Even inflatable hot tubs need care and attention if you want your investment to last. When it comes to hot tub maintenance and cleanliness, the outside ranks just as important as the inside. Your outer frame’s most important job is housing all the internal components, which means any compromisation in its quality can impact your system’s operations. Invest in a mild, non-abrasive cleaner to wipe away dirt accumulation from the shell and the outer frame. Using a non-sudsing cleaner can help deliver a cleaner rinse that won’t leave soap residue or buildup. Check with your hot tub manufacturer to see if they make a special cleaner that’s suitable for your hot tub. Leisure Time Spa Fast Gloss can keep the shell looking as good as it did the day you installed it. Once your shell has been cleaned and dried, cover the shell surface in a thin layer of the sealant. This coating helps fend off sun damage and oxidation. For wooden hot tubs, check with your manufacturer to determine the best way to keep your wood finish looking fresh. Purchasing a hot tub cover can help keep away unwanted debris, which makes for easier cleaning and maintenance. But since your cover is constantly exposed to the elements, it also needs cleaning and maintenance (though these requirements are minimal compared to your hot tub). Use a vinyl cleaner and soft wiping cloth only on the top part of the cover. Using this cleaner on the underside can let the chemicals get into the water. If you need to clean underneath the cover, use a garden hose or non-abrasive sponge. Make sure you inspect your cover for any tears or holes that could potentially let debris enter your hot tub. If you find any defects, contact your dealer to learn the best way to repair them. Accessories can often be overlooked in hot tub maintenance and cleaning. If you purchased spa pillows or other add-on items, follow the cleaning instructions in your Owner’s Manual for the best possible care. A truly clean hot tub goes beyond scrubbing the visible dirt and changing the water. You’ll need to learn how to sanitize your hot tub properly to get rid of all the microscopic bits that can eventually cause problems if left untreated. Hot tub maintenance relies on good water filtration to keep your system functioning. But particle buildup can clog your system and prevent your water from filtering properly. Spray your cartridges with a garden hose to loosen and remove any debris. Be sure to rotate the cartridge while you spray to get in between the filter pleats. Replace your filters every three years. Even with regular cleanings, soap, detergents, suntan lotions and other chemicals can build up in your spa and create long-term problems. A full water replacement can help prevent these and other issues. How often you should replace your water depends on your hot tub and the number of people who regularly use it. Take the total number of gallons of water your hot tub holds and divide it by three. Then, divide that number by the total number of daily users. This number represents how often you should change your hot tub water. A pre-filter can ensure your water is sparkling clean from the very start. These filters attach to a regular garden hose and can help eliminate metals like iron and copper from your fresh water. When in doubt, always use your Owner’s Guide to learn how to drain and refill your hot tub properly. Using clean water regularly can go a long way in reducing hot tub maintenance costs. Sanitizing your hot tub weekly may seem cumbersome, but it can go far in keeping hot tub functions at a maximum and health risks at a minimum. The type and amount of sanitizer will depend on your hot tub and manufacturer, as well as how often you use it. Plan on doing a full sanitary “shock” on a weekly basis to keep bacteria and other microorganisms in check. These thick, insulated blankets install inside the compartment door to your hot tub. This helps buffer some of the cold from reaching your equipment and can help prevent parts from freezing. You should inspect your hot tub cover regardless of the time of year, but a solid cover during the winter is especially essential. Look for signs of wear and tear, and inspect the seal. If the seal is not intact, or if you notice any sags or cracks in the cover, you might need to replace it. Use warm water to remove snow and ice from your spa cover. Forcibly removing ice could cause damage to the cover. Upon your return, make sure you check the pH and sanitize the water before you use it. Hot tub maintenance largely relies on good habits. If you can cultivate these habits from the start, you’re likely to extend the life of your hot tub investment. Inspect your hot tub cover for damage and positioning: Water exposed to outdoor elements could experience a chemical imbalance. If someone has forgotten to replace the cover or has moved it slightly, you may be unaware of it for days or weeks. Monitor the water temperature: Drastic changes in water temperature could signal an underlying issue. Look for signs of damage: Damage can happen at any time, especially to outdoor hot tubs. It’s good practice to give your hot tub a daily glance to detect any potential issues. Inspect sanitizer levels: You need to maintain the right amount of sanitizer in your spa at all times. Having too much or too little sanitizer can impact the water quality. Monitor pH balance: The water’s pH level ultimately determines if the hot tub is safe for you and your loved ones. Keep a close watch on the pH, adding sanitizers when necessary. Wipe the shell above the water line: Debris can collect on the dry part of the shell and contaminate the water. Keeping the shell clean above the water line can eliminate this debris and reduce your chance of getting it in the water. Check your spa filters: Your filters need regular cleaning. We recommend once per week to keep them in optimal condition. However, if you aren’t using your hot tub on a regular basis, you can skip to an every other week cleaning schedule. Care for your spa cover: Chemical conditioners can significantly impact the life of your hot tub cover. Using a conditioner once a month can help reduce cracking, fading, and peeling due to sunlight and other outdoor elements. Clean your equipment cabinet: Bugs, dust, grass, and other debris can become trapped in your hot tub cabinet. Clear away any dirt or debris scraps that could clog or otherwise harm your equipment. Hot tub maintenance may seem like a lot of work, but keeping your hot tub clean and in good condition will pay off for years. When it comes to hot tub maintenance, you have a lot of product options. And we’ve taken great care in selecting some of the best ones to keep your hot tub fresh and inviting for you and your family. Spa Pillows: Pillows designed for hot tubs can maximize your comfort and give you the ultimate spa experience. Spa Vac: Keep your water free of debris without having to drain the water. Side steps: Detachable steps can make getting in and out of your hot tub easier and safer. Cover Lifter: Removing a heavy hot tub cover can easily become a two-person job. Using a cover lifter can help you remove and reaffix the cover with nearly zero effort, which means you’ll get to enjoy your spa sooner. Remote Monitoring: With the right equipment, you can monitor your hot tub performance remotely. If an issue occurs, you can know about it immediately and respond to it before it gets out of control. Anti-slip mats: Hot tubs can boost your chance of experiencing a fall. Consider installing anti-slip mats, treads, and other safety devices to reduce your chance of slipping on the wet surfaces. CHECK OUT SOME GREAT HOT TUB ACCESSORIES HERE! As much as hot tubs can offer rest and relaxation, people often neglect to consider the potential danger and safety hazards of owning a hot tub. Keep your hot tub covered when it’s not being used. The cover helps keep unauthorized intruders from entering, such as neighbors or animals. It also helps prevent accidental drowning of curious toddlers or negligent children. Shower before you enter the hot tub. This helps reduce oils, lotions, and other contaminants from entering the water. Keep glass out of the hot tub. If you were to drop and break a glass in your hot tub, you risk clogging your jets with glass shards, scratching the shell, and cutting yourself and others. In addition, you will need to drain your hot tub and carefully clean and inspect it before you can use it again. Don’t wear regular clothes in the hot tub. Street clothing can contain a multitude of bacteria and other contaminants that will invade your water. Instead, opt for a clean bathing suit (preferably laundered with no soap). Keep long hair pulled up. Just like you would want to keep hair out of your shower drain, you want to take precautions to limit the amount of hair in your hot tub. Investing in a hot tub is a major decision, and your work isn’t through once your new hot tub is installed. It takes a level of commitment to keep your hot tub clean and maintained, which isn’t something many people think about when deciding to become hot tub owners. We hope these tips and tricks have given you plenty of insight into hot tub maintenance. If you’ve got a tip to share, we’d love to hear it! You can also check out our tips on saunas and swimming pools.